Centifolia Organic Moisturizing Cream gives the face and body the daily dose of moisture they need. Composed of ginkgo biloba, it fights skin aging and protects the skin against external aggressions. Shea butter and sweet almond oil with soothing powers nourish the skin deeply. Its creamy texture penetrates quickly without leaving a greasy film and makes the skin very soft. 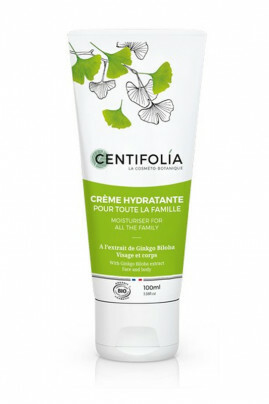 Ideal for all skin types, the whole family can enjoy the moisturizing benefits of Centifolia Organic Moisturizing Cream! Apply a small amount of organic cream instantly to the dry areas of the face and body such as feet, hands or elbows. Massage gently to penetrate well. A natural composition to moisturize all skin types! Aqua, Aloe Barbadensis Leaf Juice*, Helianthus Annuus Seed Oil, Glycerin, Butyrospermum Parkii Butter*, Caprylic/Capric Triglyceride, Dicaprylyl Carbonate, Theobroma Cacao Seed Butter*, Glyceryl Stearate Citrate, Cetyl Alcohol, Prunus Amygdalus Dulcis Oil, Ginkgo Biloba Leaf extract*, Olive Oil Decyl Esters**, Oryza Sativa Hull Powder, Squalene, Oleic Acid, Xanthan Gum, Tocopherol, Citric Acid, Sodium Hydroxide, Dehydroacetic Acid, Sodium Benzoate, Potassium Sorbate, Parfum, Benzyl Alcohol, Citral, Citronellol, Limonene, Linalool.